Pinnacle Employee Receives Distinguished Service Award | The Pinnacle P.O.V. Trujillo sits at home plate as the Jumbotron displays his face overhead. While fans of the Arizona Diamondbacks head out to Chase Field to cheer on their favorite baseball players, several members of the Phoenix community attended the June 9 game against the San Francisco Giants to support a different kind of athlete. Before the game, members of the D-Backs organization, along with representatives from Exceptional Parent magazine and CVS Caremark, presented Gabe Trujillo with the EP Maxwell J. Schleifer Distinguished Service Award. In 1997, Trujillo was diagnosed with Hopkin’s Syndrome, a rare form of Polio prevalent in asthmatics that causes paralysis after severe asthmatic episodes. With fewer than 30 cases in the world, he is the only known person to have all four limbs affected. But this condition hasn’t stopped him from accomplishing his goals and motivating others through his writing, speaking appearances, volunteering and participation in power soccer, an electric wheelchair sport. 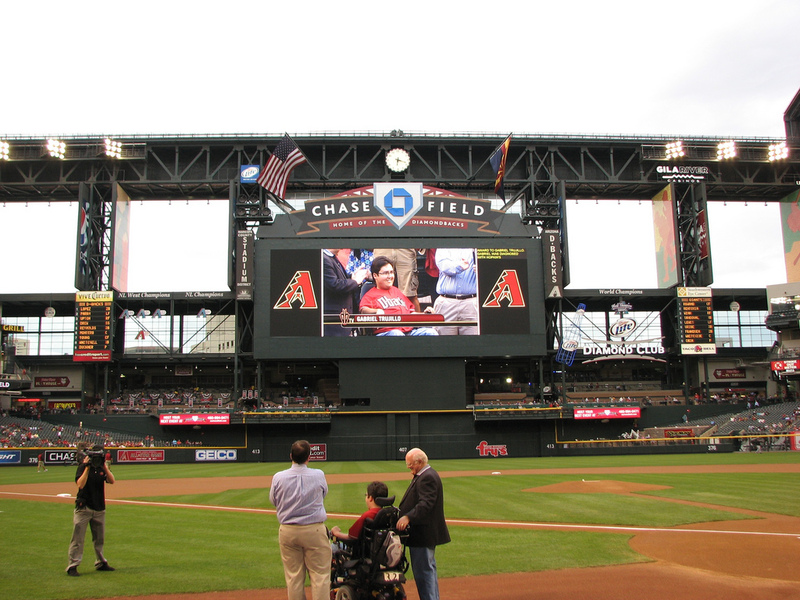 Given to people who work and advocate for people with disabilities, the Distinguished Service Award was presented to Trujillo in conjunction with Disability Awareness Night at Chase Field. The event is hosted by EP Global Communications, Inc., publisher of Exceptional Parent (EP) magazine. EP Global Communications, Inc. is dedicated to offering information and resources to people with disabilities and special needs and the family members and professionals who care for and about them. Disability Awareness Night began in 2002 and now encompasses Major and Minor League Baseball venues, the NBA, and NASCAR, with events across the nation. “Our goal is to help all Americans understand that we will become a stronger nation and better human beings when we learn to regard people with disabilities and special needs as people to be respected, not as problems to be confronted,” said Joseph M. Valenzano, president and CEO of EP Global Communications, Inc.
Trujillo currently works at Pinnacle Education, an online high school, and continues his volunteer and advocacy work with Phoenix Children’s Hospital and the Arizona Heat, his power soccer team. Currently, there are 54.6 million people living with disabilities in the United States, and while sometimes the Diamondbacks may be hard to root for, Trujillo definitely is a great example of someone who is worth cheering. ~ by pinnaclepov2224 on June 11, 2009.